Our shows are..well...wonderful! Our audiences laugh and cry and sometimes want to sing along. From Broadway musicals and poignant comedies in our beautiful home theatre to original children's productions on gym floors and auditoriums around the world, MCT performances have delighted and amazed audiences for nearly four decades. 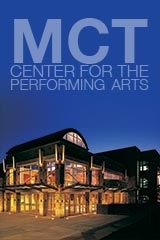 But MCT is really in the business of using an entertainment format to foster enrichment and education in children - of all ages.From world-wide tours to extensive residency camps to eclectic local activities for kids and adults, MCT performing programs are designed to develop the personal and professional skills and goals of the participants. When combined with the excellence of our productions, MCT's unique and acclaimed teaching and producing methods and philosophies have resulted in the successful fulfillment of our mission: The development of life skills in children through participation in the performing arts.